Researchers: Thomas A. Herring, Michael A. Floyd, Robert W. King, and Lei Wang, Massachusetts Institute of Technology; Timothy I. Melbourne, Walter M. Szeliga and Marcelo Santillan, Central Washington University; Mark H. Murray, New Mexico Institute of Mining and Technology; David A. Phillips and Christine M. Puskas, UNAVCO. If you want to know everything about the methods and data analysis centers for GPS networks in North America and the Caribbean, this is the review you should read. 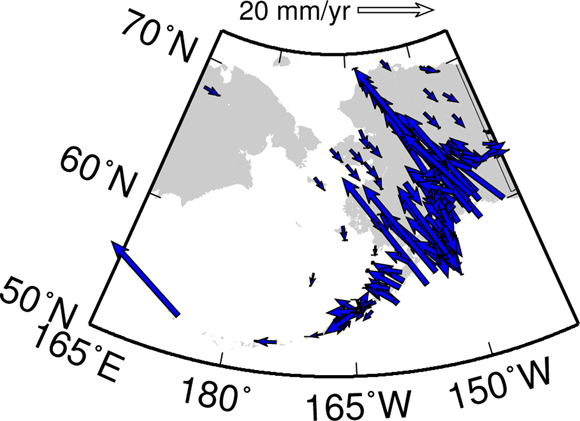 The review describes methods for determining position time series, velocities and other parameters from 2170 stations. The other parameters include coseismic and postseismic signals, seasonal signals related to the hydrosphere and atmosphere, and other transients. Detailed analyses describe the differences and uncertainties in different solutions and how analysis assumptions impact the determination of the reference frame of the Earth. 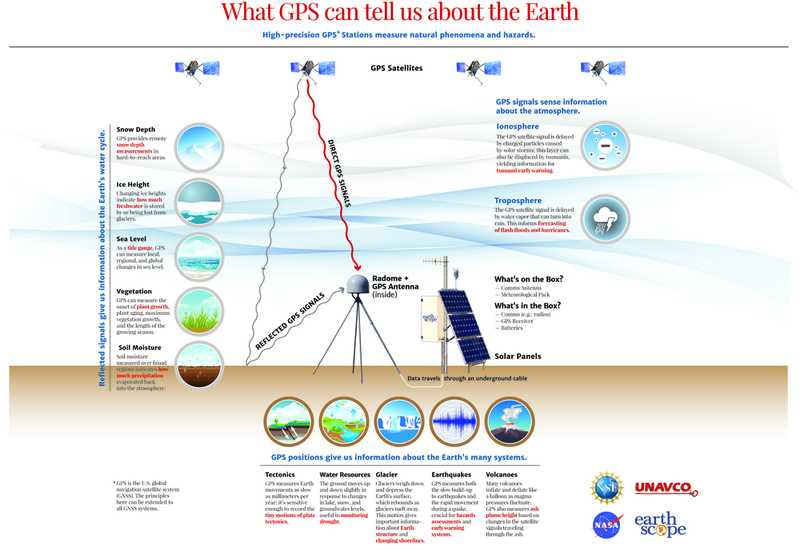 The Plate Boundary Observatory (PBO) includes a network of 1100 continuously operating Global Positioning System (GPS) stations managed by UNAVCO as part of the Geodesy Advancing Geosciences and EarthScope (GAGE) cooperative agreement funded by the U.S. National Science Foundation. PBO is located in the United States and its primary objective is to understand the North America - Pacific plate boundary, including the small subducting Juan De Fuca plate just offshore of the Pacific Northwest. Other networks included in this review are TLALOCNet in Mexico, COCONet in the Caribbean, and others. 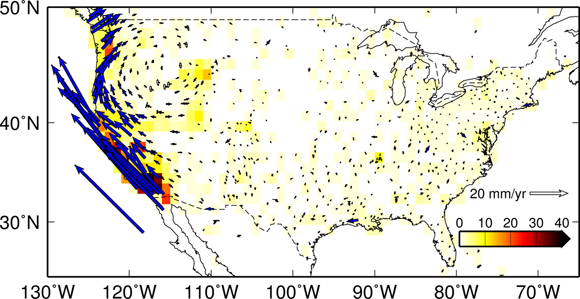 The GAGE GPS Analysis Center Coordinator is the Massachusetts Institute of Technology (MIT) and the other analysis centers are housed at the New Mexico Institute for Mining and Technology (NMT) and Central Washington University (CWU). NMT uses GAMIT/GLOBK software and CWU uses GIPSY/OASIS software to provide level 2a products. MIT provides level 2b products utilizing the results from NMT and CWU. Two types of discontinuities are noted in the GAGE position time series, equipment changes or damage and earthquakes. The differences between the two methods are small except for changes in the height over time, which may be due to the GAMIT analysis only covering one hemisphere. The main products are the position time series that show motions relative to a North America reference frame (see figures in the image gallery) and secular motions of the stations in the velocity field. Measurements of vertical velocity for decade-long time series are precise enough to be used to interpret glacial isostatic adjustment and vertical motions related to water load, opening up important new avenues of research and societal applications. In the future, the analysis and data will be updated when the new Earth reference frame is published, upgrades will be considered to process multi-constellation GNSS data, and web services will be enhanced to allow greater access, effective discovery and better integration of different datasets. Herring, T. A., T. I. Melbourne, M. H. Murray, M. A. Floyd, W. M. Szeliga, R. W. King, D. A. Phillips, C. M. Puskas, M. Santillan, and L. Wang (2016), Plate Boundary Observatory and related networks: GPS data analysis methods and geodetic products, Rev. Geophys., 54, doi:10.1002/2016RG000529.